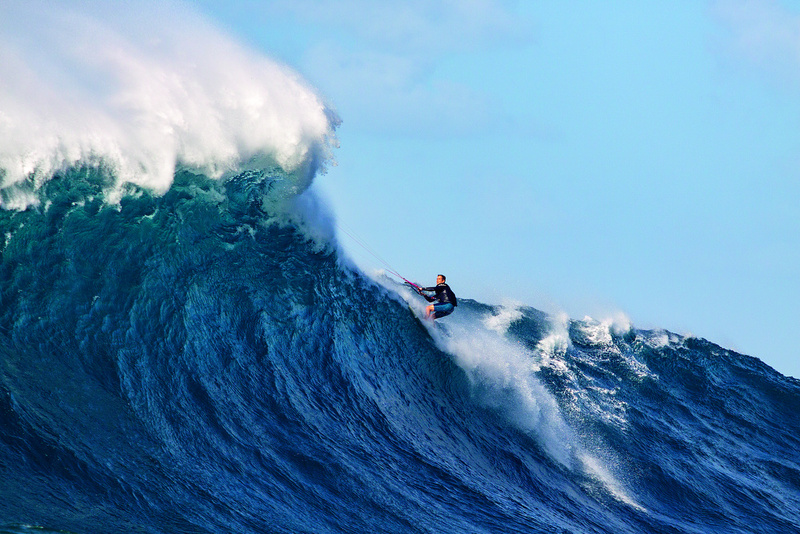 Peahi (Jaws) is unlike any other wave I’ve ridden. It takes a very special swell and wind angle to be able to kite it, and it’s pretty rare that both line up at the same time. I’ve caught some big waves in other parts of the world, but I have never seen so much water unload in one spot. It is truly amazing to see. Just watching the wave break is quite a spectacle. 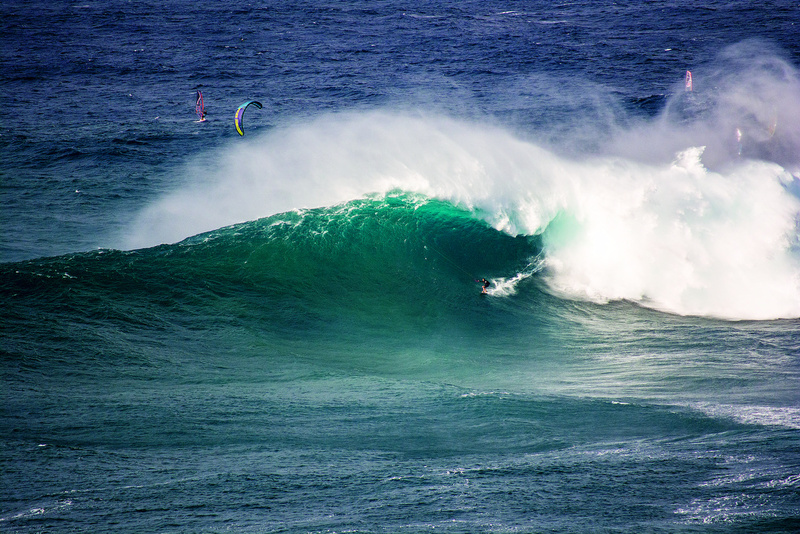 We asked Patri Mclaughlin a few questions about his sessions at this monster of a wave. What type of preparations do you make that are different than an average session? 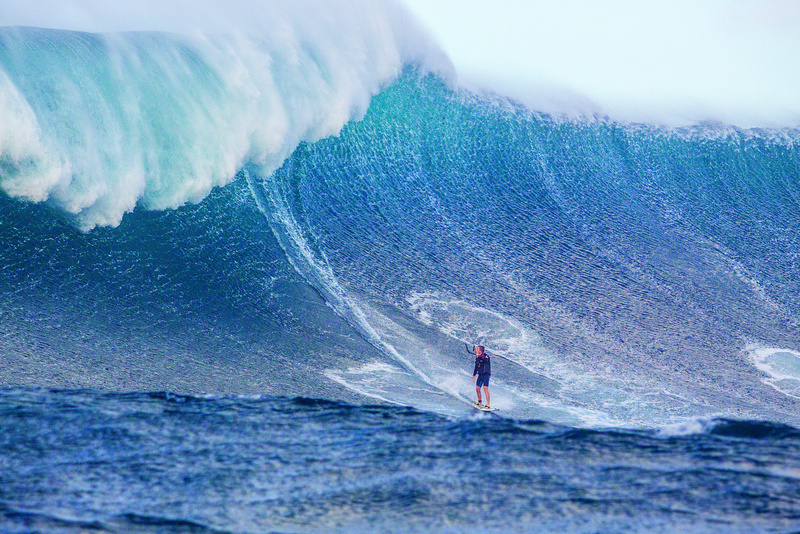 It takes a lot of preparation to feel comfortable in big waves. You need to be physically fit, but you also need to be mentally prepared. You have to know that falling is a very real possibility and you need to be prepared to get held under water without panicking. I like to say you shouldn’t kite it if you wouldn’t surf it. You need to experience what it’s like swimming in big waves just in case you crash your kite and end up in the impact zone. Is there a launch? What kind of support did you guys use? The very first time I kited Jaws my buddy Jesse Richman and I launched off a lava rock cliff. We had to get our kites into the air and wait for a surge to come up the cliff to jump into the water. We didn’t have a jet ski for support nor did we really have a solid plan to get back to shore. May not have been the best idea, but somehow we pulled it off without a hitch. However, since then I’ve had a couple mishaps. I fell tow surfing out there a few years back and dislocated my shoulder instantly. I took a whole set on the head with my shoulder out. Luckily my buddy was able to put it back in on the jet ski. It took about a year to be 100 percent again. Just last year I lost the tip of my pinky finger when it got tangled in the lines of the kite. What modifications have you made to your gear and what extra gear do you use to tackle conditions like this? I don’t change much with my equipment. I ride a production North NEO with 24-metre lines. I use a tow surfboard with footstraps though. There is so much water moving and it’s super choppy so it helps to be attached to your board. I also wear a floatation jacket just in case I fall in a bad spot. It helps to get me back to surface as fast as possible. Did you lose the tip of your finger at Jaws? 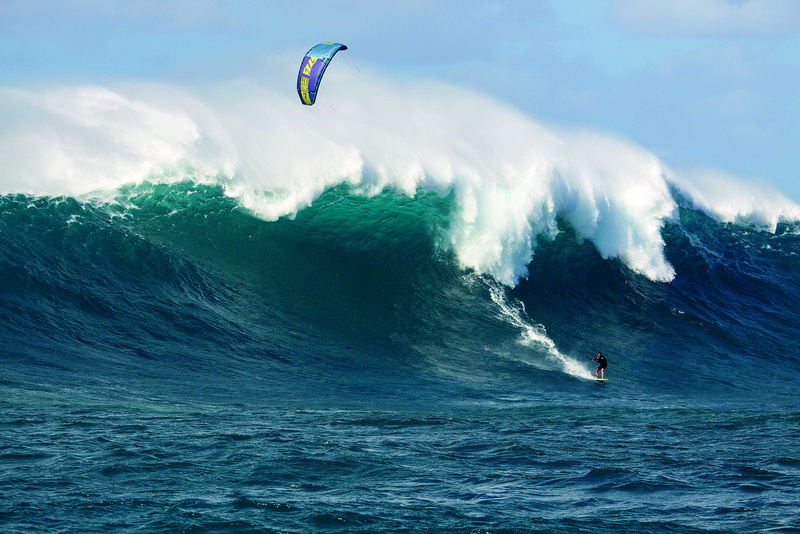 Last year I was kiting at Jaws on a 9-metre. I was super overpowered, and when I was wrapping my gear up to get back on the jet ski the kite powered up and took off. My pinky finger was trapped in the lines and all of the flesh stripped off the bone. I had to go to the hospital and they cut the bone off and sewed up the finger. It was extremely painful, but what doesn’t kill you makes you stronger and smarter. I wont get my hand stuck in the lines like that again. Who was the pioneer out there? First to surf, tow, kite, windsurf? Would be good to know the history. There have been a handful of guys that have kited Jaws before. I saw a video of some guys kiting it all the way back in 2001. It was a pretty small day, but it was cool to see kiters give it a go. Nowadays there are really only a few of us out there when it’s on. Nicole Porcella, Jesse Richman, Kai Lenny, and myself are the only guys trying to push the boundaries of what can be done out there with a kite. Other than kiting you have to mention the windsurfers. 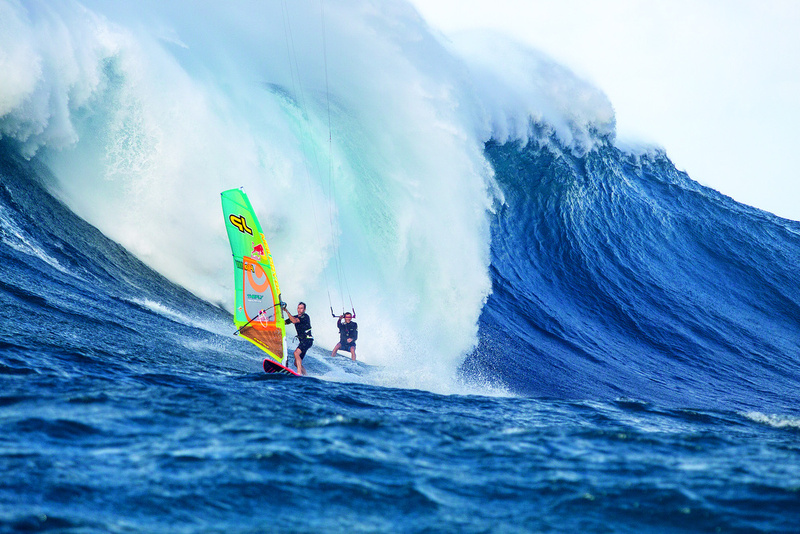 I actually heard that windsurfers were out there before Laird Hamilton started tow surfing it. Nowadays there are a huge number of guys paddle surfing. Albee Layer, Shane Dorian, and a group of guys from Maui are really pushing it, and trying to get barrelled on the biggest sets. Marcio Freire was one of the first guys out there on a paddle board. Kites, Windsurfers, Paddle Surfers, Tow Surfers, SUPs. The power of Jaws attracts alot of attention no matter what you ride. Have you surfed it? Towed it? What changes with a kite? The first time I went to Jaws was tow surfing. It’s a terrifying wave, but it was awesome to get some bombs out there. I probably towed it 10 times before the paddle crew took over. I have two guns for paddling a 10’4” and a 9’6”. I’ve paddled it probably eight different times. 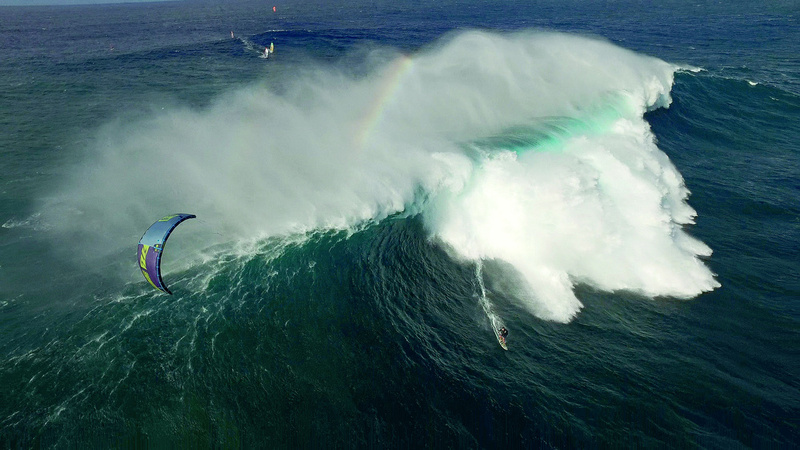 Paddling is the scariest way to catch waves at Jaws. You’re pretty much sitting waiting for a wave to come right to you without getting annihilated. I’ve fallen a bunch of times. I dislocated my shoulder towing it, and I’ve gotten proper pounded paddling a handful of times. Kiting is my favourite way to get waves out there. You can pick the biggest swell from a mile out to sea, and set up your position way easier. It’s a lot easier to get deep on the wave without falling.